I met Nez Perce fiddler Joe Broncheau (accent the first syllable) briefly back in the nineties but never got to record his music. Thankfully Jens Lund included him in some of his work for the Washington State Arts Commission. He grew up on the Nez Perce Reservation in Idaho and played for dances there as a young man in the pre WWII era. He learned a lot of the older tunes from his father and uncle who had come up from Oregon a generation earlier. 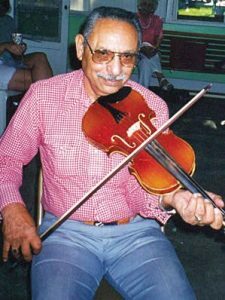 I don’t have many details of his life, but he was a strong dance fiddler with a mix of old time jigs and reels as well as tunes, particularly waltzes, that were current among Idaho Old Time Fiddlers of the Don Gish/Lloyd Wanzer generation. In researching Romeo’s Last Chance I could only find references to it as played by Northwestern fiddlers: Lloyd Wanzer, Harry Johnson, Sheila (Wright) Everts and Almon and Virginia Manes. That last one was the earliest one, a 1963 version from the Newport Folk Festival (http://research.culturalequity.org). Was it a Northwest Original? Thanks to Vivian Williams for solving the mystery. Listen to Andy DeJarlis play Romeo’s 1st Change on youtube.com. By the way, you can also go to http://www.scribd.com/doc/29100229/Andy-Dejarlis for more information on this great Métis fiddler and the confusion surrounding the variations in his name’s spelling. As tunes pass from fiddler to fiddler the names sometimes get mangled (see Old Parnell and ‘mondegreens’ in the October, 2011 Tune of the Month column). Our assumption is that the jig was a 1st change first and a last chance last as there are a number of Canadian recordings of Romeo’s 1st Change. I kind of like the new moniker though. I’m sure there’s a story there. Was it Romeo’s last chance at love? The old quadrilles (square dances) were often done in batches of several sets or “changes” with no more than a brief pause in between while the dancers caught their breath and the musicians cranked up another tune. The first change was often danced to a jig with reels played after that. (See Phil Cook’s ‘Portland Fancy’ in The Evergreen Fiddler: Vol. II). I hope you enjoy playing the tune – not too hard, but quite charming indeed. Romeo’s 1st addendum – Well, leave it to Phil Katz to set us straight. After we published the reference to this likely being composed by Andy Dejarlis Phil recalled seeing Romeo’s 1st Change mentioned in Joe Mackintosh’s book “Andy DeJarlis – The Life and Times of and Old-Time Fiddler” (Great Plains Publications, Winnepeg, Manitoba). Romeo Laplante was a good friend of Andy’s and already an accomplished fiddler when Andy took up the fiddle as a teenager. Romeo had learned many of his tunes from local Metis fiddlers. This tune in particular had been quite popular in that region and was one he loved to play and taught to Andy. Together Andy and Romeo composed the lovely Poor Girl Waltz, which is also quite popular among Northwestern Old Time Fiddlers. Romeo Laplante served with the Winnepeg Grenadiers in Hong Kong during WWII where he, along with two band mates of Andy’s, was taken prisoner. Unfortunately he did not survive the ordeal. When Andy recorded it on a 78 in 1955 he called it Romeo’s 1st Change to honor his dear friend. The flip side, by the way, was the Caribou Reel, another very cool tune.